Publishers joining Apple's iBooks store are turning their back on Amazon and its vision of the flat $9.99 ebook. Apple forced the music industry to charge 99 cents per song, so why are they helping publishers set their own prices? The difference between Amazon and Apple is this: Amazon is very much in the ebook business to sell ebooks. They want you attached to their platform. 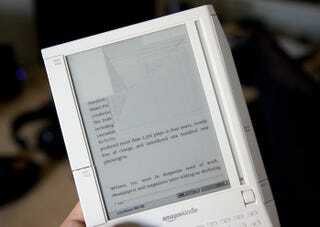 That's why the Kindle Reader is on both PC and iPhone, as well as the eponymous e-ink device. Ebooks are huge for them. They sell six ebooks for every 10 physical books. That's why they want to own the market. Apple, on the other hand, sells content in order to sell hardware. The iTunes Store, the App Store and the brand-new iBooks Store exist so you'll buy iPods, iPhones and iPads, which is where Apple really makes money. iTunes revenue is just a bonus, though an ever fatter one with the explosion of the App Store. You can see that the two companies place far different values on the content they sell. A more illustrative example: Amazon has been selling books at a loss—paying $15 for a hardcover bestseller, only to turn around and sell it for $10 on the Kindle. Apple would never, ever sell content at a loss. They make a decent bit of change, but apps and music are really just a way to fill up your iPhone. Do you remember three years ago, when Apple was battling with the record labels for control over (legal) digital music? Apple still owns 69 percent of the market and sell 1 out of every 4 songs, period—in other words, they owned the market, which deeply frightened the labels, who were afraid of losing control. Universal, the biggest label, flipped out, and even tried to build the anti-iTunes. That failed, so the music business bit the bullet (or the poison pill) and went DRM-free, not with Apple at first, but with Amazon. It became a (sorta) credible competitor to the iTunes monster, long enough to give the labels just enough extra negotiating power. When iTunes music downloads went DRM free, many of them—particularly hit singles—suddenly cost $1.29. The situation is remarkably similar, except this time, Amazon's wearing the market-maker pants. Some estimate Amazon's share of the ebook market to be 90 percent, but I've heard from people in the publishing industry say it's closer to 80 percent. But that's nitpicking. At this moment, Amazon owns ebooks. The book publishers' fears are the same as the record labels with iTunes: They're paranoid about losing control over pricing, and their own digital destiny. They're worried that books are being undervalued, and that once people have the mindset that the price of an ebook is $9.99, and not a penny more, they're doomed. They needed an insurgent player: Apple. Apple has advantages that Amazon didn't have with music: Scale and technology. iTunes has just moved 3 billion iPhone apps. Apple's sold over 250 million iPods. By contrast, Amazon's sold an estimate 2.5-3 million Kindles since it debuted 2 years ago. Analysts predict Apple will sell twice as many iPads this year alone. In terms of technology, e-Ink looks old and busted and slow next to the iPad's bright, color display. (Even the fact that the written word is much easier to stare at for long periods of time when presented on e-ink won't save the current Kindle.) An iPad can do more than books: Beautiful digital magazines, interactive textbooks, a dynamic newspaper. Oh, and it's a computer that does video, apps, music. Amazon's scrambling now to make a multitouch full color Kindle after betting on E-Ink, but that kind of development takes at least a year. Even if they churn out a full color reader that is somehow better than the iPad, it likely won't matter: It would just be a very nice reader to iPad's everything else, and it would be 9 months too late. The print industry is swirling down the toilet, and apocalypse-era publishers minds' dance with hallucinations of digital salvation via iTunes for print. It's the iPod for books. What Amazon was supposed to deliver, but now maybe never will. With that contrast in mind, all the publishers needed was a little push. All Apple had to whisper was, "Hey, we'll let you set your own prices for books. You should control your own destiny. We'd love to have you. You know, $12.99 is a really good price for a beautiful color version of your amazing books. BTW, why are you letting Amazon undersell you?" It doesn't matter that publishers make less absolute money through the agency model used by Apple—Amazon might've given them $15 for a book it sold for $10, but under the agency model, the seller takes 30 percent off the top. They wanted to feel in control, and that their books are worth something more. Steve gave them that, even as he's probably got his fingers crossed behind his back. Price would've been Amazon's major advantage over Apple too—being able to undercut Apple by setting whatever price they needed to compete would've been its ace in the hole against the iPad's flashy color screen, and everything else it can do. And now that's poofed. Apple will be able to sell you ebooks for the exact same price as Amazon. By turning the publishers against Amazon, they've effectively dicked the Kindle over. Why? To fill out another bullet point as to why you should buy an iPad. The real question is how long it'll take publishers to realize that's all they are to Apple: one little bullet point.